Jerry Jones attempts to strangle an imaginary leprechaun. The Dallas Cowboys overachieved in 2018, won the NFC East (and obviously made the playoffs as a result), won a playoff game, and then saw their defense get dominated up front by the L.A. Rams. They had a season that was better than most predicted, but ultimately fell short of an NFC Championship Game appearance for the 23rd consecutive season. The theme of this Cowboys offseason is going to be, how much will it cost to retain their own players? Lawrence is not happy at all about getting the tag, according to Clarence Hill of the Star-Telegram. Lawrence, one of the league's premiere pass rushers, finished the 2017 season with 14.5 sacks, which was tied for second in the NFL. The Cowboys then used their franchise tag on him, which he played under in 2018 at $17,143,000. After a modest dip in production, but still a very good season at 10.5 sacks, Lawrence was hoping for a long-term deal, but he and the Cowboys appear to be far apart on his worth, so the Cowboys once again slapped the tag on him, at what will amount to $20,571,600. Do not expect Lawrence to sign to the tag, to have shoulder surgery, or attend any of the OTAs or other off-season workouts until a long deal is agreed to. That's it. I guess the Cowboys also signed "DE" Christian Covington from the Texans, but at 6'2, 300 pounds, Covington will certainly play DT in the Cowboys' 4-3 defense. The deadline for Lawrence and the Cowboys to work out a long-term deal is July 15. If they cannot, Lawrence will play on the tag in 2019. Or, you know, he could just sit out the season like LeVeon Bell did. The Cowboys began the offseason among the NFL's leaders in space under the salary cap, but that went away quickly after they tagged Lawrence. As of Tuesday morning, the Cowboys are $24,302,169 under the cap. That may not be enough to lock up a young nucleus of players who are about to get a whole lot more expensive. 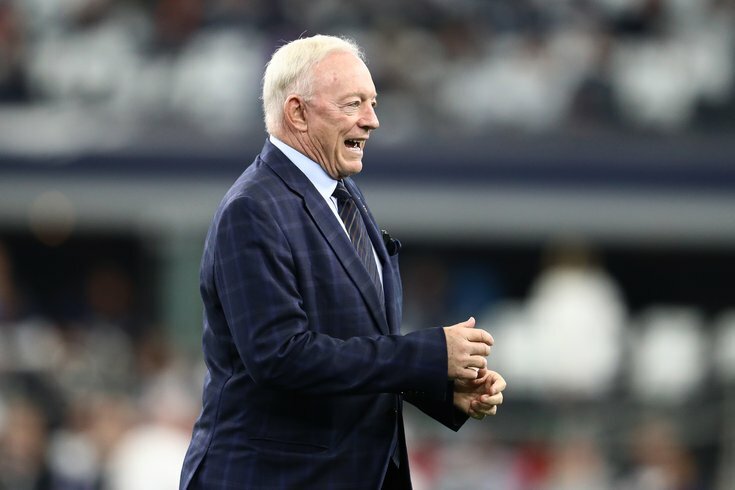 The Cowboys are going to have to pay Dak Prescott, Demarcus Lawrence, Ezekiel Elliott, Amari Cooper, Byron Jones, and Jaylon Smith over the next two years. Prescott is going to make somewhere around $30 million/year, Cooper should fetch around $18 million/year, Zeke will be up around the $16 million/year range, while Jones and Smith could both fetch over $10 million/year. With so many mouths to feed internally, the Cowboys can't add quality players from the outside, despite Earl Thomas all but begging the Cowboys to come get him during the season last year. Jason Witten signed a one year, $4.25 million contract with the Dallas Cowboys on March 6, 2019. None of the contract is guaranteed. Witten can earn up to $1.25 million in roster bonuses for being on the 53 man roster and $1 million in roster bonuses for being active on game day. Another $750,000 in incentives can increase the value of the contract to a max of $5 million if earned. Lol. Why? Witten's legs were shot before he retired, and now he's a year older. The upcoming draft class is loaded with quality tight end prospects, and there were some younger, better options in free agency. I don't get it. • DE Kerry Hyder: Hyder had a nice season in 2016, when he had 36 tackles and 8 sacks. In 2017 he tore his Achilles. In 2018, he had 6 tackles and one sack in 7 games. • DL Christian Covington: The Cowboys needed defensive line help with David Irving on his way out, and they were able to get Covington on a one year, $1.75 million contract. • FB Jamize Olawale: He played about 8 snaps per game in 2018. The Cowboys re-signed him. Analysis: ¯\_(ツ)_/¯. • WR Cole Beasley: Beasley signed a four-year, $29 million contract with the Bills. He's not worth that, and the Cowboys were right to let him walk. That said, the loss of Beasley should still sting a bit, as he gave a vertically-challenged passer like Prescott a reliable underneath target. • TE Geoff Swaim: Blake Jarwin and Dalton Schultz are both better players, so again, the Cowboys were right to let Swaim walk. He signed with the Jaguars. • LB Damien Wilson: Wilson is a sub-package player who was behind Leighton Vander Esch, Jaylon Smith, and Sean Lee on the depth chart. He signed with the Chiefs. The Cowboys are also reportedly set to meet with former Chiefs safety Eric Berry, an inspirational person and once-great player who tore an Achilles in 2017, and dealt with a nagging heel injury all season in 2018. He has played three games over the last two seasons. They are also scheduled to meet with Randall Cobb, who would replace Beasley, and who has put up Beasley-type numbers in Green Bay the last few seasons. Without knowing exactly what Lawrence is looking for, contract-wise, the clock is ticking on a resolution there. The Cowboys can ill-afford to mess up that situation, because their defense is in deep trouble without him. Otherwise, predictably, the Cowboys were not players in the first wave of free agency. They'll hunt bargains the rest of the way. Their grade is probably better saved until we see what these contract extensions for their current players look like, but they might not happen until much later this offseason. For now, we'll give them an arbitrary C+.